Cans of Coors beer are displayed on a shelf at a liquor store in Fairfax, Calif.
Molson Coors Brewing Co. is stepping up efforts to fight climate change even though recent hot weather in Europe during the World Cup has lifted beer sales for one of the world’s biggest brewers, chief executive Mark Hunter said on Wednesday. The firm cut carbon emissions from its direct operations by 15 per cent in 2017, he said, the first year of a program aimed at halving emissions by 2025 as part of a goal of limiting droughts, floods and more powerful storms. 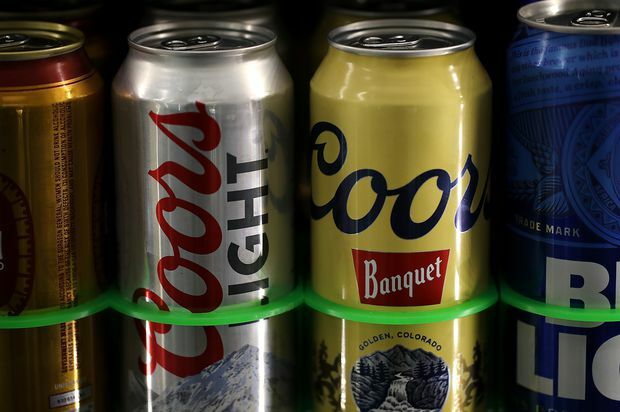 Molson Coors is also working to cut use of water and energy and aims for zero waste to landfills by 2025, he said of the firm’s “raising the bar on beer” project to protect the environment with sustainable growth. “It reduces our energy use pretty significantly, it reduces our water costs significantly. It really is win-win” for profitability and the environment, he said by telephone from Denver. Mr. Hunter said long-term disruptions to water supplies from climate change were a threat to crops including barley and hops, vital for beer. Even so, hot weather has a flip side by making people thirstier. “The last six[-to]-eight weeks in Europe have been very helpful,” Mr. Hunter said of scorching temperatures in many countries. “A World Cup is certainly helpful, but probably not as helpful as good, stable warm weather,” he said. Molson Coors produces Carling in England and Ozujsko in Croatia. He said the British brewery was self-sufficient in carbon dioxide, which puts the fizz in beer, despite shortages elsewhere in the country. He said Molson Coors was joining a UN-backed initiative by about 430 companies across the world to set “science-based” targets, meant to match the overall goals of the Paris climate agreement, adopted in 2015 by 195 countries. U.S. President Donald Trump plans to pull out of the Paris pact, doubting mainstream findings about the risks of warming. By contrast, Molson Coors plans to halve emissions within its own operations by 2025, from 2016 levels, and by 20 per cent across its entire business. The firm produces beers including Coors Light, Blue Moon and Miller Lite. Among other global big brewers setting science-based goals, Anheuser-Busch InBev plans to cut emissions by 25 per cent for each drink by 2025 from 2017 levels. Carlsberg aims for zero greenhouse gas emissions from its breweries by 2030. Mr. Hunter said the firm has stuck to earnings guidance for 2018 despite weaker-than-expected earnings in the first quarter, hit by low U.S. demand. Among 2018 goals, the company expects an underlying free cash flow of US$1.5-billion. The firm is offering incentives to farmers to improve the use of water. The company now uses 3.57 units of water to produce a unit of beer at its main breweries and wants to cut the ratio to 2.8 by 2025. Molson Coors is also reviewing the idea of cannabis-infused beer after Canada approved sales starting in October. “There is a lot to consider around this, particularly from a responsibility perspective,” Mr. Hunter said.